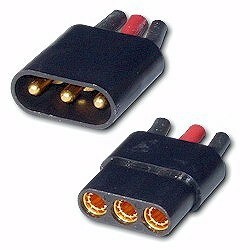 Astro 3 Pin Zero Loss Connector (2 each)#521 Designed for 13 and 14 gauge wire. Zero Loss, same resistance as 13 gauge wire. Total reverse polarity protection. Note: This connector assembly uses female pins, the shell is male, therefore gendered as "male assembly". Female & Male Set, 3-pack of gold plated 1.5mm pin diameter. Outstanding for your higher quality projects up to 15 amps. 18 gauge wire. Use on brushless motor applications. Bullet Style Pins. 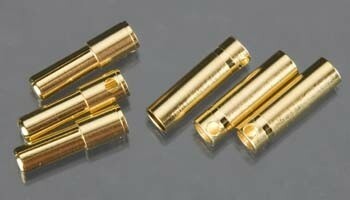 Female & Male set, 3-pack of gold plated Smooth Type 2.0mm pin diameter. Outstanding for higher quality projects up to 20 amps. 16 gauge wire. 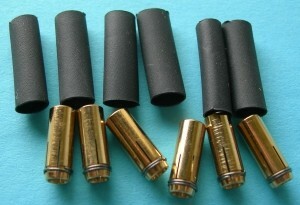 Bullet Style Pins. Female & Male set, 3-pack of gold plated connector pins, 2.5mm pin diameter. Outstanding for higher quality projects up to 30 amps. 16 gauge wire. Smooth pin style. Female & Male set, 3-pack of gold plated wire connectors 3.5mm pin diameter. Outstanding for your higher quality projects up to 50 amps. 12 gauge wire. Bullet Style Pins. Female & Male Set, 3-pack of gold plated connector pins 4.0mm pin diameter. Outstanding for higher quality projects up to 70 amps. 12 gauge wire. Bullet Style Pins. 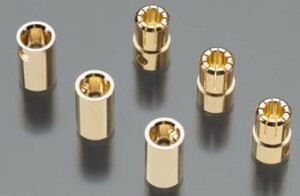 Female & Male Set, 3-pack of gold plated connectors 6.0mm pin diameter. Outstanding for higher quality projects up to 100+ amps. 10-12 gauge wire. 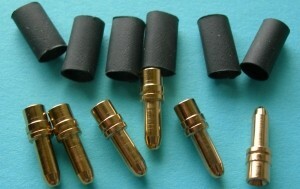 Slpit Spring Pin style plug. 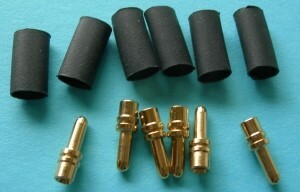 Female & Male Set, 3-pack of 8mm bullet connectors. Outstanding for higher current projects up to 100+ amps. 10-12 gauge wire. Slpit Spring Pin style plug. 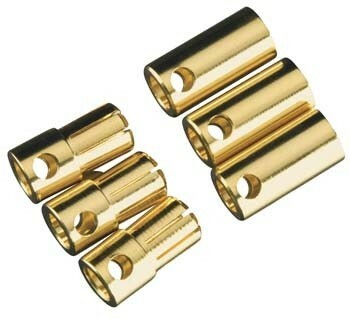 Female & Male Set, 3-pack of gold plated connectors 4mm pin diameter. Gold Plated Outstanding for higher quality projects up to 75 amps. 13-16 gauge wire. Split Spring Pin style plug. Female & Male Set, 3-pack of gold plated connectors 5.5mm pin diameter. Gold Plated Outstanding for higher quality projects up to 150 amps. 10-13 gauge wire. Split Spring Pin style plug. Female & Male Set, 3-pack of gold plated connectors 6.5mm pin diameter. Gold Plated. Outstanding for higher quality projects up to 200 amps. 8-13 gauge wire. Split Spring Pin style plug. 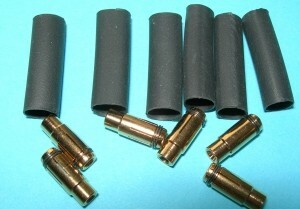 8mm bullet set. Up to 300 amps. 3 pack. Package of 6 male (motor side) 1.8mm pins. Smooth style plug popular on Euro motors. Very high quality. Heat shrink included. Enough to connectors for 2 brushless motors. Package of 3 male (motor side) 5mm pins. Smooth style plug popular on Euro motors. Very high quality. Heat shrink included. Enough to connectors for 1 brushless motor. 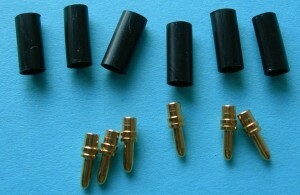 Package of 6 female 1.8mm sockets (ESC side). Smooth style plug popular on Euro motors. Very high quality. Heat shrink included. Enough to connectors for 2 brushless ESC's. Package of 6 male (motor side) 2.5mm pins. Solder cups accept cables up to 2.5mm od (3/32). Smooth style plug popular on Euro motors. Very high quality. Heat shrink included. Enough to connectors for 2 brushless motors. 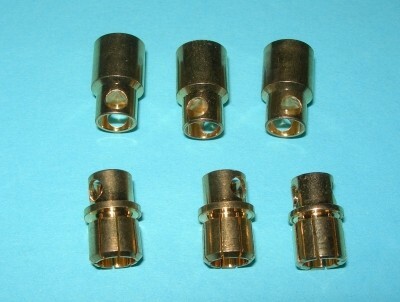 Package of 6 female 2.5mm sockets (ESC side). Solder cup accepts up to 2.5mm wire. Smooth style plug popular on Euro motors. Very high quality. Heat shrink included. Enough to connectors for 2 brushless ESC's. Package of 6 male (motor side) 3.5mm pins. Solder pocket accepts cables up to 2.5mm od (3/32). Smooth style plug popular on Euro motors. Very high quality. Heat shrink included. Enough to connectors for 2 brushless motors. Package of 6 male (motor side) 3.5mm pins. Solder pocket accepts cables up to 4mm od (3/32). Smooth style plug popular on Euro motors. Very high quality. Heat shrink included. Enough to connectors for 2 brushless motors. 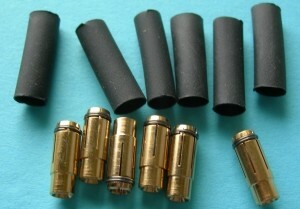 Package of 6 female 3.5mm sockets (ESC side). Solder cup accepts up to 2.5mm wire. Smooth style plug popular on Euro motors. Very high quality. Heat shrink included. Enough to connectors for 2 brushless ESC's. 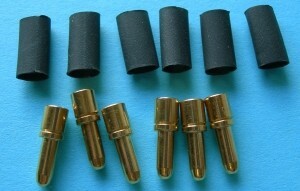 Package of 6 female 3.5mm sockets (ESC side). Solder cup accepts up to 4mm wire. Smooth style plug popular on Euro motors. Very high quality. Heat shrink included. Enough to connectors for 2 brushless ESC's. 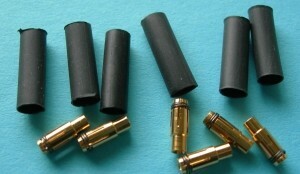 Package of 3 female 5mm sockets (ESC side). Smooth style plug popular on Euro motors. Very high quality. Heat shrink included. Enough to connectors for 1 brushless ESC.